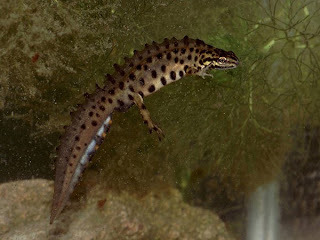 I was very pleased to find two common newts yesterday whilst cleaning out the pond. Not long ago they were on the endangered species list. They were sharing their living space with 12 mating frogs all attached (6 pairs) and refusing to let go even during their temporary trip to the bucket whilst the pond was cleaned. Now the pond water is clear and with the night spotlight installed the next few months should be interesting. Forg spawn galore and hopefully some newt spawn aswell.